Automatic or manual gearbox? Do you want to have control over changing gear in your car, so you can take account of changing driving conditions? Or do you prefer the easy life, with the car’s electronics assuming control of the job and deciding when to change up or down, ensuring that the right cogs are engaged and disengaged at the right time? There was a time when the choice was simple. There was only one type of each gearbox and whilst you could usually drive both a manual and an automatic once you’d passed your driving test, it’s also still true that if you pass your test in a car with an auto box, you have to take a separate test to be allowed to drive a manual car. 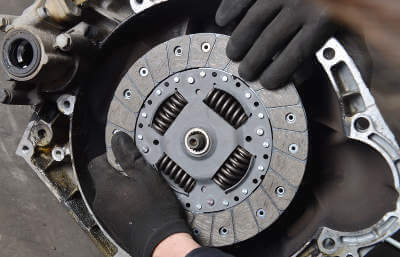 What Is An Auto Clutch And How Is It Different From A Manual? A traditional automatic gearbox uses a component called a torque converter instead of a clutch. This is designed to automatically adjust the amount of power being transmitted to the driving wheels, according to the amount of pressure being applied to the accelerator. The car automatically selects the best ratio according to the driving conditions, taking into account the car’s speed, engine revs and how heavily the driver is pressing on the accelerator. Because the car will almost always be heavier than a manual equivalent, it can be a little less economical, especially when installed in a smaller car, because the same engine is being asked to pull around more weight. However, the larger the car is the less of a factor this becomes and some of the largest auto gearboxes can have up to nine speeds, intended to enable relaxed driving in all traffic conditions. The Range Rover Evoque is an example of a car fitted with such a large auto box, the extra gears coming in handy for many owners when they need to negotiate tough, off-road terrain. And because the car is quite a big beast in the first place, the extra weight of the auto gearshift doesn’t affect it a great deal. In fact, in the cases of this and lots of other big automatics, by ensuring that the car is more often being driven in the right gear for the road conditions, it can actually save fuel in the long term. Automatic gearboxes have for many years been most popular in larger countries, particularly the United States, where they account for 90 per cent of all cars sold. Their popularity is largely because they were seen as saving a great deal of the driver’s effort in having to regularly change gear, as well as being more relaxing to drive on the wide open roads found in much of the country. But motoring writers in the UK recommend an automatic transmission far more often when it’s used in a bigger car, with Mercedes, Jaguar and BMW coming top in a rundown of the best auto cars available in the UK in 2016 by Carbuyer.co.uk. In recent years, one of the major innovations first seen in Formula One racing to be passed down into standard production cars has been the use of what’s called a semi-automatic transmission. This entails the use of an electronically-controlled clutch alongside a standard gear lever. Or it is becoming more common for such clutches to be controlled through a dashboard-mounted paddle shift. In these systems, the driver either pulls or pushes on the paddle to change up or down a gear. Because this system does away with the mechanical clutch, yet still allows the driver to be in control of the gear in which the car is being driven, they are commonly referred to as semi-automatic gearboxes. A final type of gearbox is what’s called a continuously variable transmission, commonly abbreviated to CVT. This does away completely with cogs and wheels - and so all the potential troubles which can follow when these two don’t work in complete harmony. Instead, it uses pairs of metal cones, arranged with the sharp ends facing each other, with a belt suspended between them. As car’s central computer controls the movement of the cones closer to and away from each other, the angle of the belt is changed, and this is what alters the gear ratios. One big downside, however, is the extra noise produced when the car is accelerating, because the engine note stays constant and only its volume increases as it turns more quickly. But because of the need for fewer components, this has proved a popular system for use in smaller cars, where the weight penalty of a traditional auto gearbox would be felt most keenly. Unlike in the USA, manual cars remain the biggest sellers here, perhaps because we’re a far more crowded country, and so have a far greater penchant for small, nippy motors. Our relative lack of motorways also means that we don’t have the massive need for cars with lots of labour-saving aids that applies in the US. The Society of Motor Manufacturers and Traders - the main umbrella body for dealers selling both new and used cars - says that the proportion of new cars driven off garage forecourts which have a manual gearbox has stayed roughly the same, at about 75 per cent, for the past decade. And it’s the fact that far more drivers in the UK try to watch the pounds when they’re choosing their cars which helps explain why manuals remain king. There are other sound reasons for preferring a manual car, and prime among these is that a manual box puts the driver in full control of selecting which gear the car is running in. So when all's said and done, we’re still a nation which prefers the good old stick shift. Maybe it comes down to the fact that driving a manual car requires the driver to be far more in constant touch with the controls than in an auto vehicle which seals the deal for British drivers. There’s no doubting, though, that constantly switching between gears can be hard work, especially in the kind of stop-start traffic often found around many towns and cities. Yet, somewhat counter-intuitively, it might just be that manual cars remain so popular in the UK because they give the driver that sense of being engaged with the car at all times which isn’t so much the case when mechanical parts or electronic gizmos are taking the strain. Particularly keen drivers will almost always opt for a manual gearbox, because it means they can be more closely involved with controlling the car and its speed. For those of us who do see a car as simply a means of getting us from A to B with the minimum of fuss and effort, there’s plenty of appeal in dropping the clutch and letting the car’s electronics do all the work. And it’s purely because we all have different wishes for our cars, and use them in such a variety of driving conditions, that there will always be room for both manual and auto cars - as well as those options in between. As a final thought, MoneySupermarket.com points out that, should you need to hire a car when you go abroad for a holiday, there’s a more than even chance that you’ll be given an automatic. if you ever get to a point in life when you can realise your boyhood dream of owning and driving a Ferrari, you should probably know that the prancing horse only supplies its cars with an automatic gearbox. If your gears have gone from great to grate, it could be that you need clutch repairs to help things start running smoothly again. So visit our ‘Get a Quote’ page now to find garages in your area which can do the job for you.